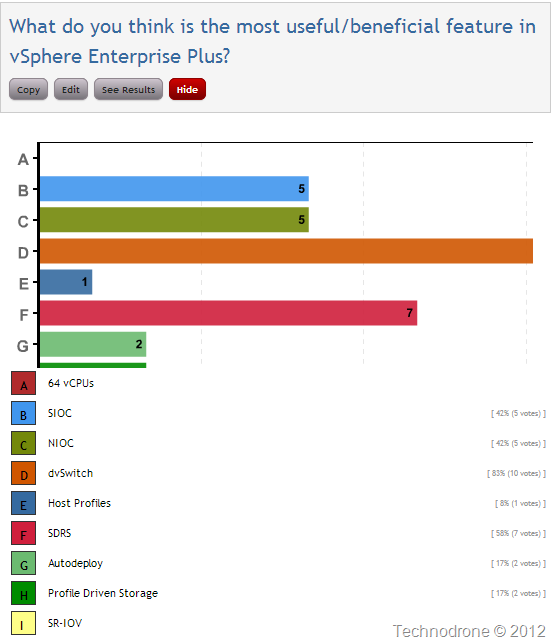 Can you name the features that are only available in vSphere Enterprise Plus edition? I am not saying that the other features are not important – but these would be my top 3. In my humble opinion I think that these are the 3 features that are most used by the enterprise market (or whoever purchases Enterprise Plus licenses). So let’s get back to the tile of this post. Take a look at this Twitter conversation. Every single word in this thread is absolute gold. Host Profiles. They allow you to create a "template" for your ESXi hosts and with the click of a button, or the Enter key (it should be scripted of course) you can set the configuration of your ESXi host – practically down to the last bit. All your hosts will be the same and of course you can have different templates for different purposes. But why does this have to be a feature only available in the top-tier editions? As you can see in the poll above – people do not prioritize this as a highly useful feature, that does not mean they do not use it (although that could possibly be deducted from the poll – that would not be accurate). From my perspective. I do not use Host Profiles – for the following reasons. My ESXi builds are all exactly the same. I have them down to a fine art, usually a custom kickstart script which configures exactly what I need. The post-configuration is then done with Powershell. How long did it take me to perfect it? Well .. a while – but now that it there – a deployment is 100% accurate – 100% of the time. Always works (as it should). Host profiles – works almost all of the time, and was just too picky to get it working. I have heard this from a great number of people – so it not just me. Most people I know do not use Host-Profiles to check Host compliance. If they are already using it – it will be for deployment – not for compliance – and if my deployment is already covered by some other method - why do I need to use Host Profiles? Before Autodeploy was introduced, we used other tools, like Ultimate Deployment Appliance or the ESX Deployment Appliance. They were great solutions – for their time, but I suppose since Autodeploy was released – they are not really used for ESXi deployment that much any more. Having your hosts configured exactly the same – should be a standard feature. It is in VMware’s best interests. It means less support calls, less anguish from customers, better customer adoption – there are more than enough reasons. Over the years a large portion of the “Enterprise” features have slowly but surely been moving down to the lower editions vSphere Replication, HA, vMotion, Edge, FT, sVmotion – just to name a few. These are all features that were available once upon a time in the Enterprise and above editions and are now part of the Standard product. I think VMware realized that this was what every customer was asking for, allowed for better customer adoption – and placed their features on par with those of Microsoft who were constantly badgering VMware for being too expensive (they still are and probably always will). We have evolved, technology has evolved and today, Host profiles can be done other ways – be it in house scripts or the way I think it will evolve in the future - by an external 3rd-party tools (such as Puppet/Chef - I expect that Nick Weaver will have some news for us on this front at VMware PEX). A large number of companies are already using these tools for all their machine life-cycle management for their physical servers (if they have any), for their VM’s – and soon I assume for their Hypervisors as well. I foresee that the day is not far off when these tools control not only the provisioning of VM’s to cloud environments (like they do today) but also control the configuration of these cloud environments as well. After all – it is all API’s so how far off can we really be? The real Enterprise features should and always will stay in the top-tier editions. The dvSwitch is a must-have for any big environment – specifically if you are using vCloud. SIOC and NIOC as well. I think it is time to review what should actually be considered an “Enterpise Plus” feature. And while we are at it .. VMware this applies to Autodeploy as well. Please feel free to add your comments and thoughts below. Please do not vote for Me!